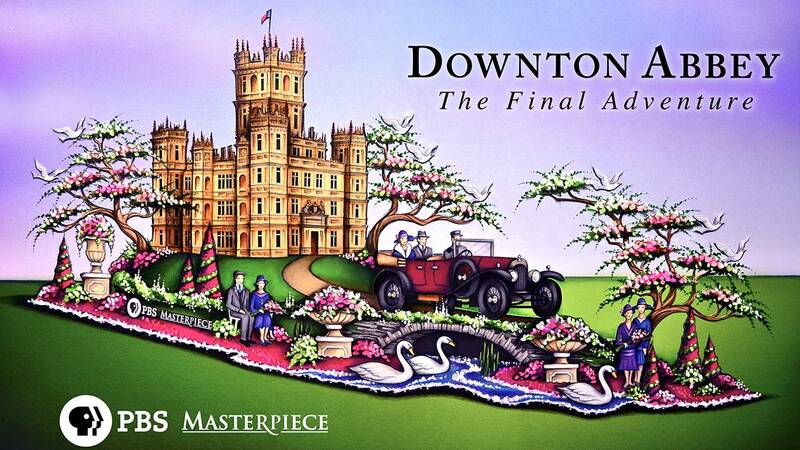 ARLINGTON, VA; December 3, 2015 – Fans of the beloved critically acclaimed drama “Downton Abbey” on MASTERPIECE on PBS will get a special treat on New Year’s Day when a new float celebrating the show debuts in the 127th Rose Parade® on January 1, 2016. The Crawley family estate has been painstakingly recreated for the float, complete with a magnificent landscape depicting English rose gardens and rolling green lawns and a 1919 Bentley driven by the family chauffeur. The float, themed “The Final Adventure” (a nod to the parade’s theme of “Find Your Adventure”), celebrates the much-anticipated “Downton Abbey, The Final Season,” a Carnival Films/MASTERPIECE co-production airing Sundays on PBS beginning January 3, 2016, at 9 p.m. ET. The float will feature more than 60,000 roses in 20 different varieties, including velvety “Roseberry” and “Cherry O”; fragile pink “Titanic” and “Priceless”; and English garden roses, rarely seen on Rose Parade floats. Oriental lilies, snapdragons, hypericum and a variety of orchids will provide accents throughout the garden. A custom-made elevator lift was created for Downton Abbey’s central tower. This lift allows the tower to drop straight down into the center of the castle so that it can pass under power lines and bridges. The float is 18' wide by 24' high and weighs approximately 15 tons. The float was designed by Charles Meier from Paradiso Parade Floats, took approximately 2,000 hours to construct and will take about 6,000 hours to decorate. The top-rated primetime show in PBS, MASTERPIECE is presented on PBS by WGBH Boston. Rebecca Eaton is executive producer. Funding for the series is provided by Viking River Cruises and Audible, with additional support from public television viewers and contributors to The MASTERPIECE Trust, created to help ensure the series’ future. The sixth and final season of Downton Abbey is currently airing on ITV and will return to PBS in January 2016. Carnival’s latest series The Last Kingdom is currently airing on BBC TWO and BBC America. Stan Lee’s Lucky Man also airs on Sky One in 2016.